Diamond Chain pin oven chain is built with 60 pitch ANSI chain and uses proprietary spring mounted tips as well as proprietary lubricants to ensure higher heat tolerance and meet rigorous food safety requirements. Diamond pin oven roller chain comes with bendable, breakaway or stainless steel carrier pins that are built into the chain rather than added on as attachments, making the chain stronger, more durable, and longer lasting. A stronger chain requires less maintenance and reduces overall downtime. Diamond’s o-ring chains are designed to maintain internal lubrication and repel contaminants, even at temperatures up to 450o F. Our Ring Leader o-ring pin oven chains are available with the same pin options as our standard pin oven chain, treated to withstand high temperatures. 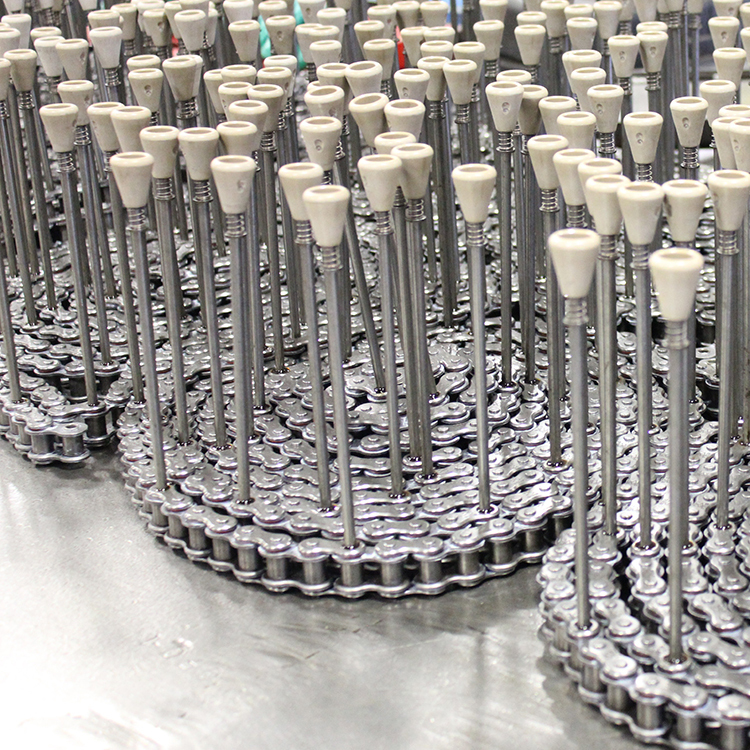 Diamond Chain makes our pin oven chain customizable by offering over 50 different tips and pin extensions to fit on our ANSI chain standard base. If a link of our pin oven chain needs to be repaired, our design allows replacement without grinding pins, making the process easier and faster and reducing your production downtime. Diamond Chain pin oven chain is designed for maximum safety, efficiency and durability. To find out more about how Diamond Chain products can improve your production, contact us today.